Hey Ive been going to this car wash for the past six months. Have not had a problem until last month when the "disco" car wash scratched the entire passenger side all the way down my $51,000 truck. I went in and talked to the manager. He then told me he would contact the owner and get them to contact me. So I waited a month and heard nothing. So I went back and politely asked if the owner was going to contact me about the scratch on my truck and the manager then said "its in the works." So I decide to try the touch free car wash with their "gold" wash and my entire tunnel cover was completely untouched. Went back in and talked to the manager and simply asked why the car wash could not clean my truck and asked him to take a look. He replied "no" and told me to try a different car wash. Zero professionalism involved with the owner/management. If someone could please contact me regarding the scratch That would be great. I used to go here once a month, get $20 in loonies for laundry (my suite has a coin-operated shared laundry room), vacuum my car (usually I put in $5 out of the $20 and take my time) and wash it. I take my time and usually spend somewhere around $20 total. Usually Ill buy a couple products out of their overpriced vending machine too. I dont have to go to the bank, and they make some money. I figure its win-win for both of us. Today I got bitched at for "taking all [his] loonies" by one of the attendants. He said "youre not gonna use all of that on the vacuum are ya?" I told him I wouldnt be using any of it in the vacuum now and left. He kept yelling at me to go to a bank as I was walking away. Sure, Ill go to a bank, but I wont be going here anymore! Good luck laundering your drug money. I went to this car wash and paid the full $14 for the gold wash. I looked at my car afterwards and I was not impressed. A lot of dirt was left on the back of my car so I went back. I asked a guy named Greg who worked there about it and he was very knowledgeable. He explained it was what they used to deice the roads in the winter that also makes dirt cling to the vehicles. He recommended the automatic track wash Bay instead because a person manually preps your vehicle for it. He ran me through free of charge and the car looked great after! Greg was very understanding and sure knew his stuff. I give this place a 5/5 thanks to Greg! Coolest carwash experience ever. We were given a coupon for the deluxe wash, worth $16, from Kamloops Kia when they serviced our vehicle. We pulled into the wash bay and were instructed by the workman to put our car in neutral with the brake off. A disco ball hung at the ceiling above to the left. While my family and I pondered aloud as to why it might be there, we began to experience multi colored lighting effects through the soap and water on the windshield. I dont know who was more entertained by this - the kids or me. I want to go again. 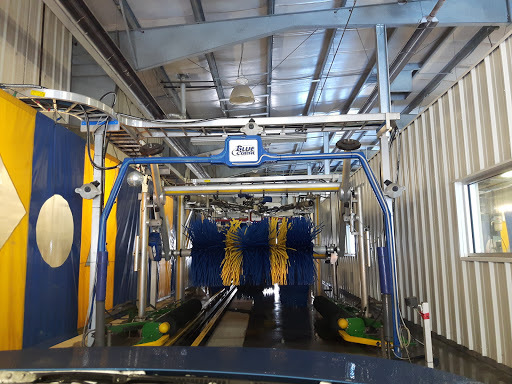 Absolutely the best auto wash in Kamloops. They deal with the trouble spots by hand before you enter - never had a dirty spot remaining. Only a couple bucks more than it costs to do it myself but a much better job. Ive been there 6 times now - every time was the same... perfect. Its a convenient place to wash my vehicles when its cold out. I wish they gave you a little more time on the pressure washer tho. If you go to Robo car wash you get alot more time for 1$ less. Smoking when costumers are waiting to go through the wash and having it blow into our vehicle is disgusting! Anything is better then Robo so glad to give them some competition. ripped me off on visa purchase and refused to go good. Good better and best options here. Super busy place. Pressure washer barely had any pressure. Wash it yourself ,or have them do it .